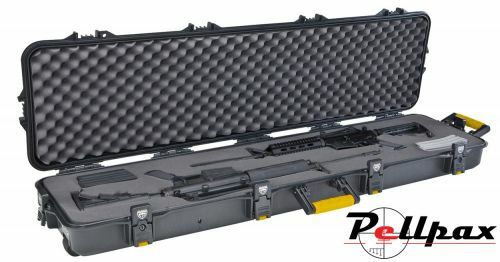 The All Weather Double rifle case from Plano is a strong and very durable case designed to house 2 rifles in comfort and security through all conditions and types of travel. The case has a Dri-Loc seal around the whole edge of the lid and base at to provide the best in water and air tights shields that is available.The dual stage, heavy duty lockable latches also assist in this durability and prevent any unwanted access to the interior. The case has a built in pressure valve for airline travel, and wheels to one end to make transportation a breeze. The interior has pluck foam to allow the customisation to whatever firearms you may have.